The Bush era has been a special time -- for the deficit (back, and larger than ever), for the countries formerly known as our allies, and for the English language. Here it all is, straight from the horse's, er, mouth. "See, without the tax relief package, there would have been a deficit, but there wouldn't have been the commiserate -- not 'commiserate' -- the kick to our economy that occurred as a result of the tax relief." "Free nations don't develop weapons of mass destruction." "[A]s you know, these are open forums, you're able to come and listen to what I have to say." The Deluxe Edition also includes reality checks: coherent Bush statements about major issues that bear no relation to the truth. The Deluxe Election-Edition Bushisms is essential reading for everyone still wondering what the past four years have all been about. The question I am most frequently asked about the Bushisms series is, "Do you really think the President of the United States is dumb?" Dipping into this volume may leave the impression that George W. Bush is a simple dimwit. Let's face it: a man who cannot talk about education without making a humiliating grammatical mistake ("The illiteracy level of our children are appalling"); who cannot keep straight the three branches of government ("It's the executive branch's job to interpret law"); who coins ridiculous words ("Hispanos," arbolist," "subliminable," "resignate," "transformationed"); who habitually says the opposite of what he intends ("the death tax is good for people from all walks of life!") sounds like a grade-A, straw-for-brains imbecile. If you don't care to pursue the matter any further, that view will serve. George W. Bush has governed, for the most part, the way a straightforward numskull of the Right would, undermining the fiscal condition of the nation, squandering the goodwill of the world after September 11, and allowing huge problems (global warming, entitlement spending, AIDS) to metastasize toward catastrophe while botching the major areas of domestic policy through a combination of ideology, incomprehension, and indifference. If Bush isn't exactly the moron he sounds, his synaptic misfirings offer a plausible proxy for the idiocy of his presidency. In reality, however, there's more to it. The assemblage of a presidential term's worth of malapropisms, solecisms, gaffes, spoonerisms, and truisms -- drawn together here from the best of Bushisms old and new -- tends to imply that Bush's lack of fluency in English is tantamount to an absence of intelligence. But as we all know from experience, the inarticulate can be shrewd, the fluent fatuous. In Bush's case, the symptoms indicate a specific malady -- some kind of language-skill deficit akin to dyslexia -- that does not indicate a lack of mental capacity per se. To judge from the President's SAT scores (566 verbal, 640 math), his IQ is somewhere north of average. It's significantly higher than that of any number politicians respected for their wisdom, such as Bill Bradley (485 verbal). Bush also compensates with his nonverbal acumen. As he notes, "smart comes in all kinds of different ways." The President's way is an aptitude for connecting to people, in part though his familiar use of nicknames, banter, and physicality. He charms people by remembering who they are and has a powerful memory for details and figures that truly matter to him, such as batting stats from the 1950s. Bush also has a keen political sense, sharpened under the tutelage of Karl Rove. What's more, calling the President a cretin helps him in various ways. For one, it absolves him of responsibility. Like Reagan, Bush avoids blame for all manner of contradictions, implausible assertions, and outright lies by appearing an amiable dunce. If he knows not what he does, blame goes to the three puppeteers, Cheney, Rove, and Rumsfeld. For another, it breeds sympathy. We wouldn't laugh at FDR because he couldn't walk. Is it less cruel to laugh at GWB because he can't talk? (Perhaps not, but we can't help it.) The soft bigotry of low expectations also means Bush is seen to outperform by merely getting by. Finally, elitist condescension, however merited, helps cement Bush's bond to the public. But if numskull is an imprecise description of the President, it is not altogether inaccurate. Bush may not have been born stupid, but he has achieved stupidity, and now wears it as a badge of honor. What makes mocking this president fair as well as funny is that Bush is, or at least once was, capable of learning, reading, and thinking. We know he has discipline and can work hard (at least when the goal is reducing his time for a three-mile run). Instead he has chosen, for most of his life, to coast -- on name, charm, good looks, and the easy access to capital afforded by family connections. Christopher Hitchens described him perfectly when he commented during the 2000 campaign that Bush was "unusually incurious, abnormally unintelligent, amazingly inarticulate, fantastically uncultured, extraordinarily uneducated, and apparently quite proud of all these things." The most obvious expression of Bush's choice of ignorance is that, at the age of fifty-seven, he doesn't know anything about policy or history. After years of working as his dad's spear-chucker in Washington, Bush didn't understand the difference between Medicare and Medicaid, the second and third largest federal pro-grams. Well into his plans for invading Iraq, he still couldn't get -- despite the frustrated efforts of his briefers -- the distinction between Sunni and Shiite Muslims, the key religious divide in a country he was then about to occupy. Though he sometimes carries books for show, he either does not read them or doesn't absorb anything from them. In one of the Republican primary debates in 2000, Bush was asked what lessons he took from the experience of Dean Acheson and George Marshall, based on an Acheson biography he claimed to be reading. Bush's answer: "The lessons learned are is that the United States must not retreat within our borders. That we must promote the peace....In order promote the peace, I believe we ought to be a free-trading nation." 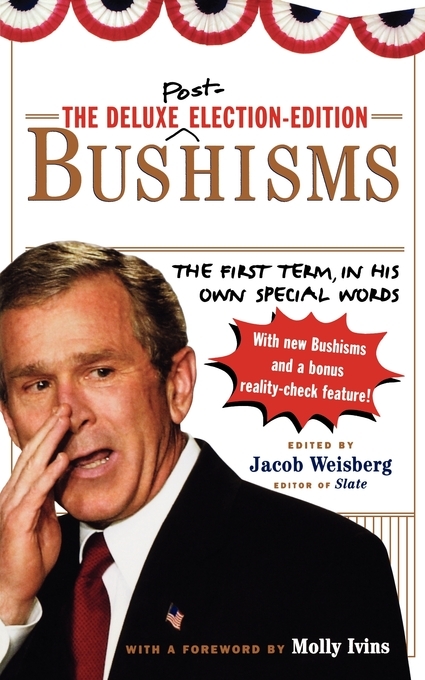 In other words, all Bush got from the book was his own stump -- and stumped -- speech. Bush's ignorance is so transparent that many of his intimates do not bother to dispute it even in public. Consider the testimony of several who know him well. Richard Perle, foreign policy adviser: "The first time I met Bush 43...two things became clear. One, he didn't know very much. The other was that he had the confidence to ask questions that revealed he didn't know very much." David Frum, former speechwriter: "Bush had a poor memory for facts and figures....Fire a question at him about the specifics of his administration's policies, and he often appeared uncertain. Nobody would ever enroll him in a quiz show." Laura Bush, spouse: "George is not an overly introspective person. He has good instincts, and he goes with them. He doesn't need to evaluate and reevaluate a decision. He doesn't try to overthink. He likes action." John DiIulio, former head of faith-based initiatives: "There is no precedent in any modern White House for what is going on in this one: a complete lack of policy apparatus. What you've got is everything -- and I mean everything -- being run by the political arm. Everything -- and I mean everything -- is being run by the Mayberry Machiavellis." Paul O'Neill, former Treasury secretary: "The only way I can describe it is that, well, the President is like a blind man in a roomful of deaf people. There is no discernible connection." A second, more damning aspect of Bush's mind-set is that he doesn't want to know about anything in detail, however important. Since college, he has spilled over with contempt for knowledge, equating learning with snobbery and making a joke of his own anti-intellectualism ("[William F. Buckley] wrote a book at Yale; I read one," he once quipped at a black-tie event.) By Paul O'Neill's account, Bush could sit through an hour-long presentation about the state of the economy without asking a single question. ("I was bored as hell," the President fired back, ostensibly in jest.) Insiders warned O'Neill not to send the President anything longer than two pages -- though in the Treasury secretary's experience, Bush read nothing at all. Closely related to this aggressive ignorance is a third feature of Bush's mentality: laziness. Again, this is a lifelong trait. Bush's college grades were mostly C's (including a 73 in Introduction to the American Political System). At the start of the term, one year, the star of the Yale football team spotted him in the back row during the shopping period for courses. "Hey! George Bush is in this class!" Calvin Hill shouted to his teammates. "This is the one for us!" As governor of Texas, Bush would take a long break in the middle of his short workday -- for a run followed by a stretch of video golf or computer solitaire. Aides describe a fruit fly's attention span and a policy of zero tolerance for extended discussion. A fourth and final quality of Bush's mind is that it does not think. The President does not like to hear debates about issues. Offered an option, he makes up his mind quickly and doesn't reconsider. At an elementary school, a child once asked him whether it was hard to make decisions as president. "Most of the decisions come pretty easily for me, to be frank with you," he replied. By leaping to conclusions based on what he "believes," Bush avoids contemplating even the most obvious basic contradictions: between his policy of tax cuts and reducing the deficit; between his call for a humble foreign policy based on alliances and his unilateral assertion of American power; between his support for in-vitro fertilization (which destroys embryos) and his opposition to fetal stem cell research (because it destroys embryos). Why would someone capable of being smart choose to be stupid? To shed light on that question, it's necessary to examine George W.'s relationship with his father. This filial bond involves more tension than meets the eye. Dad was away for much of his oldest son's childhood -- on business trips, in Washington, and abroad. The oldest son grew up closer to his acid-tongued mother, and acted out against the absent parent -- through adolescent misbehavior, academic failure, dissipation, and basically not accomplishing anything at all until well into his forties. Dubya's youthful screwups and smart-aleck attitude reflect some combination of protest, plea for attention, and flailing attempt to compete. Until a decade ago, his résumé read like a send-up of his dad's. Bush senior was a star student at Andover and Phi Beta Kappa at Yale, where he was also captain of the baseball team; Junior struggled through with gentleman's C's and, though he loved baseball, couldn't make the college lineup. Père was a bomber pilot in the Pacific; fils sat out 'Nam in the Texas Air National Guard, where he lost flying privileges by not showing up. Dad drove to Texas in 1947 to get rich in the oil business and actually did; Son tried the same in 1975 and drilled dry holes for a decade. Bush the elder got elected to Congress in 1966; Shrub ran in 1978, didn't know what he was talking about, and got clobbered. Through all this incompetent emulation runs an undercurrent of hostility. In an oft-told anecdote circa 1973, GWB -- after getting wasted at a party and driving over a neighbor's trash can in Houston -- challenged his dad. "I hear you're lookin' for me," W. told the chairman of the Republican National Committee. "You want to go mano a mano right here?" Some years later at a state dinner, he told the Queen of England he was being seated far away because he was the black sheep of the family. After half a lifetime of this kind of frustration, Bush decided to straighten out and fly right. Nursing a hangover at a fortieth-birthday weekend, he gave up Wild Turkey, cold turkey. Shortly thereafter, with the help of Billy Graham, he put himself in the hands of a higher power and began attending church regularly. He became obsessed with punctuality. He developed a rigid daily routine. Thus did Prince Hal molt into a quasi-evangelical King Henry. And it worked! Putting together a deal to buy the Texas Rangers, the ne'er-do-well finally tasted success. With success, he grew closer to his father, taking on the role of henchboy and family avenger. This culminated in his 1994 challenge to Texas governor Ann Richards, who had twitted the first President Bush at the 1992 Democratic convention ("Poor George can't help it -- he was born with a silver foot in his mouth"). Curiously, this late arrival at adulthood did not involve Bush becoming in any way thoughtful. Having originally chosen stupidity as rebellion, he now stuck with it out of conformity. The promise-keeper, reformed alkie path he chose not only drastically curtailed personal choices he no longer wanted, it supplied an all-encompassing order, offered guidance on policy questions, and prevented the need for much in the way of actual information. Bush's old answer to hard questions was "I don't know and who cares." His new answer was "Wait a second while I check with Jesus." A remaining bit of poignancy in Bush's new life was the unresolved struggle with his father. "All I ask," he implored a reporter while running for governor in 1994, "is that for once you guys stop seeing me as the son of George Bush." In his campaigns, W. has kept his dad offstage (in an exceptional appearance on the eve of the 2000 New Hampshire primary, 41 appeared on stage and called his son "this boy"). While some describe the second Bush presidency as a "restoration," it is in at least equal measure a repudiation of the first. The son's harder-edged conservatism explicitly rejects the old man's approach to such issues as abortion, taxes, and relations with Israel. This Oedipally induced ignorance has expressed itself most dangerously in Bush's mishandling of the war in Iraq. Dubya polished off his old man's greatest enemy, Saddam Hussein, but only by lampooning 41's great accomplishment at coalition-building in the first Gulf War. Drunk on "moral claret," as Hendrik Hertzberg of The New Yorker memorably put it, Bush led the country to war on false pretenses and neglected to plan the occupation that would inevitably follow his invasion. A more knowledgeable and engaged president might have questioned the quality of the evidence about Saddam's supposed nuclear program. One who preferred to be intelligent about what he was getting into surely would have asked about what might happen if the occupiers' reception turned out to be unfriendly. Instead, he got God's sign-off and rolled the dice. Bush's budget-busting tax cuts exemplify a similar phenomenon, driven by an alternate set of ideologues. As the President says, we misunderestimate him. And we do so at our peril. He was not born stupid; he chose stupidity. This deluxe election-edition Bushisms offers a new feature that may be more telling than all the garbled quotes put together -- statements by the President that are both clear and grammatically correct, but demonstrably untrue. Bush may look like a well-meaning dolt. On consideration, he's something far more dangerous: a dedicated fool.